Country music legend Loretta Lynn will celebrate her 50th year making music with a special invitation-only event to be held this Friday (9/24) at the Loretta Lynn Ranch in Hurricane Mills, Tenn.
Held on-site at Lynn’s 18,000 square foot Coal Miner’s Daughter Museum and billed as A Tribute to an American Icon, the evening’s activities include a catered reception, media Q&A session and a performance by Lynn’s sister, Crystal Gayle, following the official unveiling of Gayle’s new display inside the museum. Event invitations were extended to select industry, media and artists, as well as Lynn’s family and closest friends. The media Q&A session begins at 5:30 PM/CT, with the reception following at 6:00 PM. Lynn will appear at the reception to briefly address the event’s attendees and mingle with other artists, industry and media. Gayle’s performance is at 9:00 PM and is open to the public. Lynn’s A Tribute to an American Icon 50th anniversary celebration coincides with the superstar’s final performance of the year at her Hurricane Mills ranch and home, to be held Saturday, Sept. 25. The concert is open to the public and is one of the special attractions available during the weekend events for Lynn’s fans and the general public. 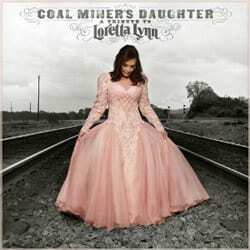 Lynn’s much-anticipated tribute album, Coal Miner’s Daughter: A Tribute to Loretta Lynn, will be released on Columbia Records on Nov. 9, 2010. The project, which features special guests Sheryl Crow, Steve Earle, Faith Hill, Alan Jackson, Kid Rock, Miranda Lambert, Martina McBride, Allison Moorer, Paramore, Reba, Carrie Underwood, The White Stripes, Lucinda Williams, Gretchen Wilson and Lee Ann Womack, features an updated version of her classic track, “Coal Miner’s Daughter.” The single, performed by Lynn with Lambert and Crow, shipped to Country radio on Sept. 14 and is available for digital download purchase on Sept. 28. The Loretta Lynn Ranch and Coal Miner’s Daughter Museum is located at 44 Hurricane Mills Road, Hurricane Mills, TN, 37978. Call (931) 296-7700 or visit www.LorettaLynn.com for tickets and more information.